A preceding column describes the labour theory of value (abbreviated LTV) of Sam de Wolff. With her de Wolff tries to advance and innovate the traditional LTV of Karl Marx. In the labour theory of value the (exchange) value of a product is equal to the amount of labour time, that is spent on the product. The work of De Wolff is characterized by a combination of the LTV and the marginal analysis, in the way it was presented for the first time by the economist Hermann H. Gossen, and later was perfected by the economists William S. Jevons and Léon Walras. Contrary to other economists De Wolff uses the LTV mainly in order to determine the total size of the production in the society. For him the exchange value (the price) of products is of secondary importance. It is typical for De Wolff that he invents his own terminology for all the relevant quantities in his model. Thus he prefers to refer to utility with the word pleasure, and to marginal utility with the expression intensity of pleasure. The introductory column just mentionned about the LTV describes how De Wolff uses a simple Robinsonade in order to determine the most efficient size of production. In the simple Robinsonade the society generates just one product, namely corn. But in his main work Het Economisch Getij De Wolff tries to model the more complex case of a society with a diverse product assortment. Also here the new insights of the theory of marginal utility are profitable. The present column aims to describe this extended model of De Wolff in a clear way. It should immediately be added, that De Wolff sometimes lapses into digressions, that make a strange impression on the modern economist1. Your columnist can not judge whether De Wolff himself is confused. It may be, that the knowledge of the time just did not allow for a more clear wording. 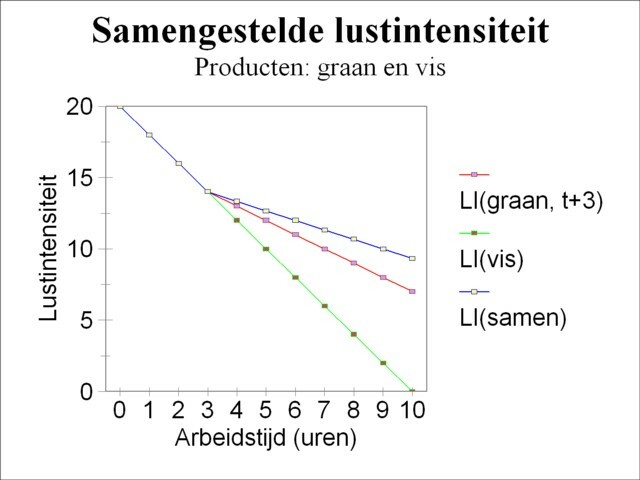 In formula 5 the variable τ is the optimal quantity of labour time, which must be spent on the harvest of corn. In order to calculate τ the formulas 3 and 4 should be substituted in the formula 5. The result is τ = 4 hours of labour. In other words, the Robinson person chooses a yield of corn equal to 4 working hours and a yield of fish equal to 5 working hours. Alternatively, the formula 5 can be solved in a graphic way. The graphic approach uses the fact, that τ on the righthand side of the formula 5 appears with a minus-sign. 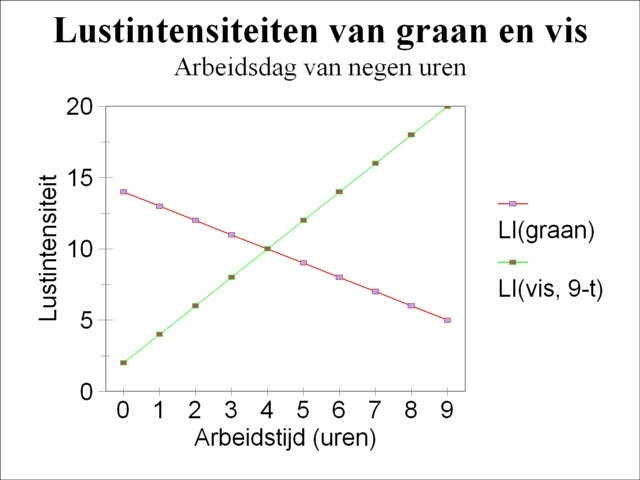 The pleasure intensities LIg and LIv are drawn ih the same figure, however with the axis for LIv extending in the opposite direction5. The result is shown in the figure 1. It can be read from the figure, that the intersection is indeed at τ = 4 working hours. After this five-finger exercise De Wolff tackles the complex task of determining the combined pleasure intensity LI(t) for two products. Contrary to the situation discussed just now, here the quantity of labour time t can assume any possible value (at least, within the time horizon of the separate pleasure functions). It turns out, that the elaboration of this exercise also provides for an alternative way to solve the situation with t=9 hours. In the composition of his optimal product combination the Robinson person will check first whether one of the two products supplies a unique pleasure. An investigation of the formulas 3 and 4 shows, that this is indeed the case, for during the first three working hours LIv(t) is always larger than LIg(t). This is for instance clearly visible in the figure 1. Therefore these hours will certainly be spent on fishery. From the point t=3 the situation becomes more difficult, because at that moment the harvest of corn and the fishery both supply the same pleasure intensity, the size of 14. This is shown in outline in the figure 2 by a shift of the origin t=0 of the formula 3 to t=3. Suppose that the Robinson person decides to change from fishery to the harvest of corn. As soon as he works a minute in the harvest of corn, LIg will drop below 14, while LIv will remain unchanged at 14. Then he is forced to engage again in fishery, at least for a moment, several seconds, until LIv is lowered to just below LIg. In this way he must jump back and forth between the fish and the corn. In reality this is of course impossible, so that the Robinsonade is not a very convincing choice of model6. 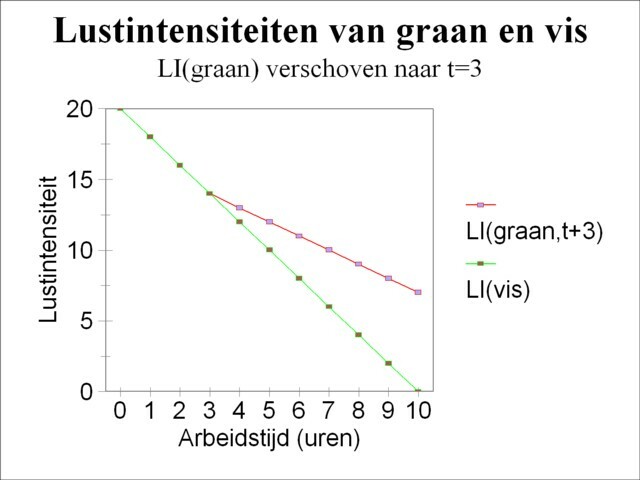 Anyhow, the result of this continuous change is that the decrease of LIg(t) and LIv(t) with time will be the same. The substitution of t'= t-3 in 7c leads to LI(t) = 16 − 2/3 × t, at least for t>3. As expected the combination of two products yields more pleasure intensity than each of the products separately. The time allocation of one third for fishery and two thirds for the harvest of corn appeals to the intuition. For according to the formulas 3 and 4 the pleasure intensity of fish diminishes twice as fast as for the corn. The labour time of fishing must as it were be slowed down with a factor of two with respect to the labour time of the harvest of corn. This is precisely what has been done by splitting each time interval into a fraction α and a fraction 1 − α. In summary: until t=3 the combined pleasure intensity LI(t) is equal to LIv(t), and from that moment on it is equal to the formula 7c. 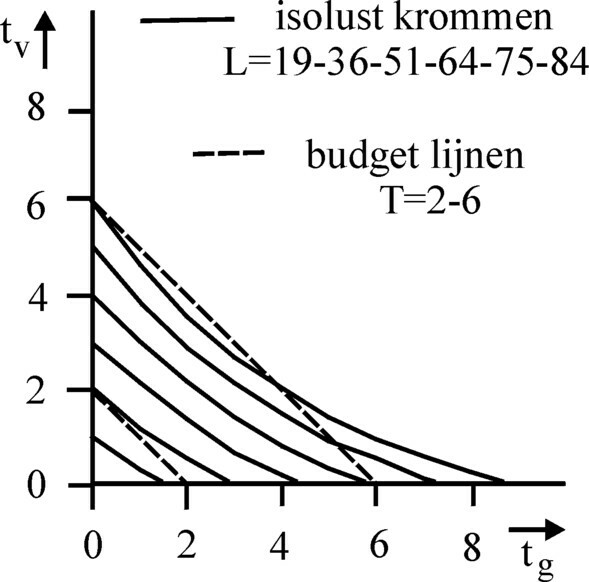 The figure 3 shows LI(t) in a graphical form. Until t=3 the Robinson person will exclusively fish, and after that he will spend a third of each time unit on fishery and two thirds to the harvest of corn. For t=6 there will be 4 hours of fishing and 2 hours for the harvest of corn (see also the preceding text). Etcetera. De Wolff remarks, that the order of the activities is irrelevant. In a working day of nine hours the Robinson person is free to harvest during the first 4 hours, and then to fish during 5 hours7. Finally De Wolff tries to generalize his example, and he asks himself, how the pleasure intensity will vary for an arbitrary number of products. He believes that the method, which is presented in the preceding text, can be applied again for each additional product. In stead of two line segments, like in the figure 3, the pleasure intensity will exhibit a number of bends. Then the pleasure intensity gets the shape, which is presented in the figure 4. For a very large number of products she will even transform into a continuous curve. However it should be noted here, that the whole method is only applicable, as long as the pleasure of the products is of the form L(t) = c×t + d×t2. Of course this form is by no means self-evident8. The downward inclination of the combined pleasure intensity is the equivalent of the First Law of Gossen, which in our days is also called the law of the decreasing marginal utility. The model of De Wolff clearly demands for a comparison with the conventional utility theory9.